How does a large aviation convention get to business in the same town where only days before the largest mass shooting in United States history took place? As I prepared to leave for the National Business Aviation Association (NBAA) Convention, I was asking myself this very question. It seemed surreal and made me sad to think of traveling to the site of such a tragedy to do business that suddenly seemed much less important than it had before in light of the loss of so many innocent lives and the suffering of so many others who were injured, physically or otherwise, in the senseless attack. I boarded my flight and came anyways, as did thousands of others. 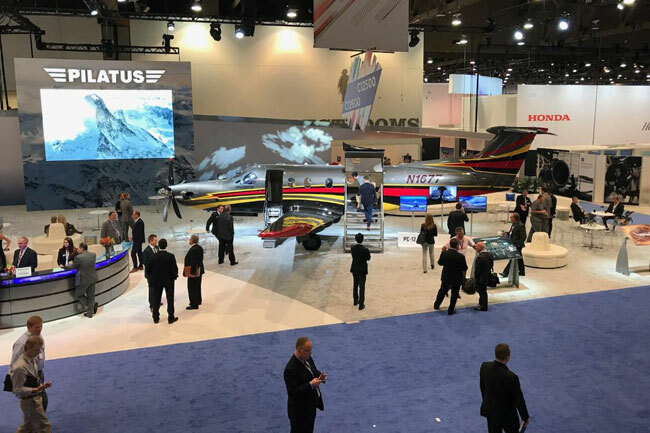 Officially, NBAA got underway on Tuesday, just eight days after what was the worst mass shooting in US history. The attack claimed the lives of 58 and injured hundreds of others who were attending a country and western concert adjacent to Mandalay Bay resort. NBAA takes place at the Las Vegas Convention Center, 15 minutes to the north by car from the site of the mass violence, but Las Vegas, for all its glitter and neon, is a small town in many ways, and the people who live there were all victims of the killer, Stephen Paddock, whose motives the authorities have yet to determine. While the show started Tuesday, the first press event was a couple of days before, on Sunday, and exhibitors began arriving in Las Vegas to set up for the show even earlier than that, just days after the tragedy. I arrived on Sunday afternoon, and Las Vegas residents were still deeply emotional. My Uber driver, who picked me up at McCarren Airport and took me to my hotel on the strip, told me his story, the first of many I’d hear over the next couple of days. He’d just finished driving for the night a half hour before the shooting began, and he was at home, unaware of the tragedy unfolding nearby when his adult son came home and told him. The two, he said, watched reports all night long. He has, he said, not been able to sleep well since the attack, and it has rekindled memories of the terrorist attacks of September 11th, 2001, when his sister narrowly avoided dying in the World Trade Center because she was late for work, the first time in her life, my driver told me. It took 12 hours, however, before he heard from her, and the pain of that full day of fearing for the worst was still evident in his voice. I was ambivalent about coming to the show myself, and I wasn’t alone. After sharing my feelings in a Facebook post with friends, many of them confessed the same strong, mixed emotions about attending the event. One confessed that he was hoping that something would come up that would prevent him from being able to come to Las Vegas, and another dear friend just came up to me on Day One of the show, tears in her eyes, and gave me a long, heartfelt hug. At the same time, we all knew that it was important for us to be there. The city of Las Vegas survives on tourist dollars, and it has taken a real hit since the attacks, understandably so. But even more than an economic show of support, it felt to me as though our presence here this week was saying to Las Vegas, “You are our brothers and sisters and we are here for you in this time of need.” Sometimes being there means going out and seeing a show or buying a meal. But never forgetting. Not because you’re trying not to forget but because you can’t help but remember. If this year’s NBAA show is down in attendance, it will come as no surprise. Being here is my job, and it’s my friends’ jobs, too. But for tens of thousands of attendees, being here is voluntary. Being here is about celebrating the joy of jets, about buying, about learning and about making plans for the future. These are things that can be deferred, and if they needed to do that, then that’s what they needed to do. All things are harder to do in Las Vegas this week, and that’s just the way it is. There’s no right or wrong way to mourn, no limits on who gets to mourn or who needs to. In a very real way all of us were the victims of a madman’s senseless violence. It will take time to recover. And that’s what we’re doing here in Las Vegas, as we talk about airplanes and engines and avionics, debate the politics of aviation or reunite with friends. And as Vegas is strong and resilient, so are we in aviation, and if it helps in any way, and I know that it does, our being here is part of the first steps to recovery, for Las Vegas, for aviation and for us all. *I’ve personally donated to a GoFundMe fundraising page, the Las Vegas Victims’ Fund, that directly supports the victims of the shooting. The initiative has already raised more than $10 million. I encourage everyone who can to do what they can to help.